Many people love sauerkraut and I’m one of them. There are thousands of good recipes for this amazing food. The flavor will definitely grow on you as you continue to eat it. Sauerkraut might be one of the most important foods you ever eat. It’s incredible for your immune system. It is loaded with vitamins, minerals, enzymes, bacteria and is teeming with life. Sauerkraut is a german fermented vegetable made from fermenting cabbages. Virtually all cultures around the world have their staple fermented food. For the germans it’s sauerkraut, for the chinese it’s kimchi or miso, for the Russians it’s kefir and cheese. Isn’t it interesting that we call these other populations “cultures” and essentially that’s what sauerkraut is, a cultured food? As Americans we don’t work with our food anymore like other cultures who do pickling or canning. We eat all of our “food” from boxes and cans from the grocery store. Poor Americans. 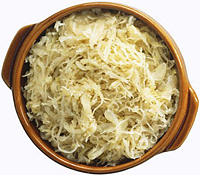 Sauerkraut is absolutely teeming with life and enzymes. Enzymes are critical for good health and they are essential for just about every cellular activity. Withough proteinaceous enzymes, there would be no life. The more enzymes your food has, the easier it is to digest, absorb, assimilate and excrete from the body. Cabbage that is not even fermented is part of the crucifore family which is known to have anti cancer benefits. When you ferment this powerful anti cancer food, it becomes exponentially more powerful in all its benefits. Since the cabbage has already been predigested by the bacteria it’s already “gone bad.” This food will last for years in a cool refrigerator. It will continue to ferment but very slowly since it’s so cool. I’ve heard that when Columbus was sailing across the Atlantic, they had hundreds of pounds of sauerkraut with them. I don’t think Columbus had any Tupperware airtight containers or refrigerators when he decided to pay the Indians a visit. Storing food wasn’t easy back then and fermentation was a skill many people had. It’s a great food to always have on hand and put away for a rainy day. In case there’s a natural disaster or one day the food supply somehow becomes interrupted, having extra sauerkraut on hand can keep you going for months and months. It’s been said that we are essentially a garden infolded on ourselves. Our inner garden is our gut. The roots of our garden are the small villi inside the intestinal walls. The compost or soil of our garden is the food we eat. Who are our gardeners then? Our internal gardeners (those tending to our gardens and feeding the nutrients to our bodies) are the bacteria. When we eat, we don’t feed ourselves. We feed our bacteria which biologically trans-mutates the nutrients, minerals and vitamins from the food via the villi through the intestinal wall directly to our bloodstream. So when we eat, we’re feeding our bacteria who then feeds us the nutrients. Our immune system is very much correlated to the bacteria. Don’t want the flu? Don’t want cancer? Feed your internal gardeners. Eat fermented foods. Making sauerkraut or any fermented food is quite easy actually, you just need to know the process and it becomes second nature. First you’ll want to shred up some organic red or green cabbage. For my 10 liter crock I can fit typically 10 cabbages inside it depending on the size of the cabbage. Peel away a couple of the biggest outer pieces of the cabbage while trying to keep them from tearing or ripping apart. You’ll need to keep these so that the weighted plates don’t sit directly on top of the shredded cabbage. Shred the cabbage. You can do this in a variety of ways. You can cut them up into small narrow slices and feed them into something like a food processor. Another option is cut them up manually using a big kitchen knife. The latter is probably the cleanest although it takes a bit longer. It’s up to you. The idea here is to cut them up into small little shreds or bits of cabbage. The smaller the better as it will ferment quicker since more surface area is exposed. The larger something is (like an entire head of cabbage NOT cut up) the longer it will take to ferment. The more surface area is exposed the quicker it ferments. Once your done with the shredding process, I suggest having 2 big bowls. One to hold all the cabbage, the other to “mash up” small amounts of cabbage with your hands. Put a few big handfuls of the shredded cabbage into the empty bowl along with some organic, sun dried sea salt to taste. Simply sprinkle some salt on it and mash it up in your hands until there’s excess water left over. The more salt you use the faster and easier it will turn soggy (which is what you want) and watery when you mash it up in your hands. The downside with using too much salt is of course flavor and too much sodium. Just find the balancing act. I have faith in ya. Just to each batch by piece meal and when each batch is sufficiently mashed up, simply pack it into the crock pot. Continue this process until you’re all done with the cabbages. Once your crock is filled to the top, keep smashing it down by pressing on it allowing the watery brind level to be ABOVE the sauerkraut. Essentially the sauerkraut needs to be sitting underneath the water. So keep backing it in allowing the water to be above the sauerkraut. If you didn’t mash it up enough you can make your own brind by putting some salt into some high quality water and pouring that into the crock so the level of brind is above the sauerkraut level. After that, you’ll want to place the big cabbage leaves (that you took off at the beginning and hopefully put aside) right on top of the sauerkraut which is still sitting below the water level. This protects the sauerkraut from coming in direct contact with the weighted plate that’s probably dirty. Then put the weighted plate on top of the leaves and keep pressing down. When you’re all done even the weighted plates will be beneath the water/brind level. Put the top on and fill the mote with water and set the pot somewhere where it’s about 70 degrees and not in the direct sunlight. The hotter it is, the quicker the bacteria will multiply and the cabbage will ferment. The colder it is the longer it will take to ferment. If the temperature is around 68 to 75 degrees I’ll let it ferment for about 2 full weeks. It depends on what you like. The longer it ferments the healthier it is for you and the more mushy the consistency will be. The shorter it ferments the less beneficial bacteria there is and the crunchier the cabbage will be. It’s totally up to you. Personally I think of this food as a medicine that I eat each day so I like it as powerful and as fermented as it can possibly be. The flavor will grow on you as you continue to make sauerkraut. I used the 10 Liter Harsch Gairtopf Fermenting Crock Pot below. I recommend at least the 10 liter that way you only have to make a new batch every few months. I also recommend getting somebody to help you or it will take a very long time. With two people it usually takes about an hour and a half including clean up. What types of fermented foods do you eat?